Hunter Laing has unveiled ‘The Kinship’, a range of six bottlings of exceptionally rare Islay whiskies, which will only be sold at their new shop on Islay during and after the Feis Ile whisky festival. The six single cask Islay whiskies in the Kinship collection have a combined age of 181 years and were hand-picked by iconic whisky distiller Jim McEwan. The legendary master distiller was recently appointed Production Director of Hunter Laing’s Ardnahoe Distillery, which will become the ninth whisky distillery on Islay when it opens early next year. The Kinship range has been bottled for the Festival as a tribute to Ardnahoe’s neighbours on Islay and to herald the start of the construction of Ardnahoe on the island. The whiskies will only be available at Hunter Laing’s new shop at Islay House Square, Bridgend from 10am on Friday 26th May, the first day of Feis Ile, and will be on sale during the Islay Festival of Music and Malt while stocks last. The shop, which will remain open for at least a year until the build of Ardnahoe Distillery is complete, will also sell a range of Hunter Laing bottlings. 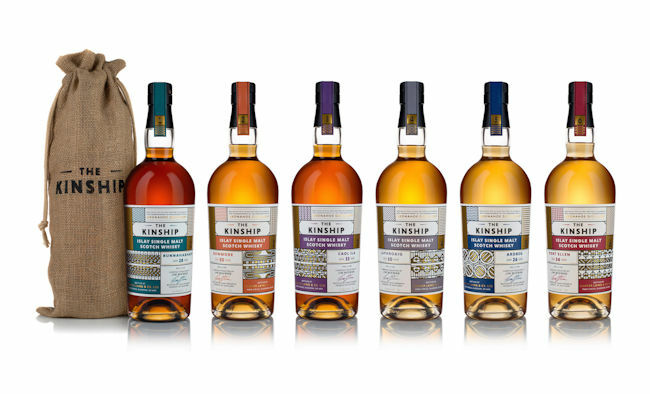 The Kinship range, which has labels representing different aspects of the Scotch whisky production process - harvest, malting, fermentation, distillation, maturation and bottling - will also be sampled at two Ardnahoe tastings hosted by Jim McEwan during the festival on 30 May and 1st June. The cask-strength whiskies are among the rarest casks Hunter Laing has ever released. The range comprises of a 34-year-old sherry cask Port Ellen (£1800), 33-year-old sherry cask Caol Ila (£375), 30-year old sherry cask Bowmore (£495), 30-year-old Bourbon cask Laphroaig (£720), 28-year-old sherry cask Bunnahabhain (£310) and a 26-year-old Bourbon cask Ardbeg (£720). As each whisky is bottled from a single cask, they are available in limited quantities with, for example, fewer than 210 bottles of the Ardbeg in existence. Each bottle comes presented in an individual jute bag. The Port Ellen whisky is noted by McEwan as being like “a tidal wave in a glass” whilst the Bunnahabhain is described as “without doubt the best sherry-matured Bunnahabhain I have tasted”. Of the Kinship, Jim McEwan said: “I knew before I joined the Hunter Laing family to embark on the journey to create Ardnahoe that they had an amazing array of casks. So having the chance to search through their whisky stocks for exceptional examples of Islay whisky was an incredible experience. In addition to releasing The Kinship range, the Hunter Laing team are staging daily visits to the Ardnahoe Distillery site. The visits are free, with a shuttle bus taking groups from Persabus Farm to the site on the north-east coast of the island. The Kinship range is available during Feis Ile from 10am Friday 26th May at the Ardnahoe shop, Islay House Square, Brigend, PA44 7NZ.